For business analysts who want to quickly and effectively deliver business knowledge to Agile developers. Apply your BA skills in an Agile environment! Are you a business analyst working in or moving to an Agile environment? This course prepares you introducing you to the recognised practices in Agile BA. You’ll discover how the work and approach differs from the traditional BA role. By the end of the course, you will know how to apply your BA expertise to excel in any popular flavour of Agile. 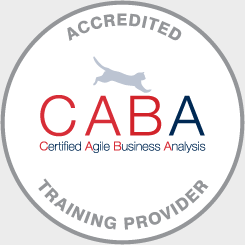 This course is directly mapped to the activities, tasks and skills defined in the Agile Extension to the BABOK® Guide published by the IIBA® (July 2013) and developed in partnership with the Agile Alliance. Business Analysts needing a clear understanding of Agile and its applications. Business Analysts wanting to improve the way they work in Agile projects. Anyone interested in business analysis who wishes to build their Agile capabilities. Anyone involved in software projects wanting to accredit their Agile skills for recognition among employers, clients and peers. Business Analysts wishing to accredit their Agile skills for recognition among employers, clients and peers. EXTRA COURSE INCLUSIONS: Our Pass Guarantee, Exam Revision Questions, Career Assistance Program (CAP) and other Agile goodies are just a few of the extra inclusions you receive when training with Planit – the leading provider of iSQI® Accredited Certified Agile training. View our full list of extra inclusions. "Great course. Great introduction to Agile." Candidates are required to sit a one hour, 40 questions multiple choice examination designed to evaluate a candidate's knowledge, understanding and ability to apply concepts included in the Certified Agile Business Analysis syllabus. Candidates are required to score 26 or more correct answers to pass. Each question will be worth one mark.